'Do I know you?' Zara Falconer’s convenient wedding to tycoon Tomas Gallo freed her from her mercenary uncle. 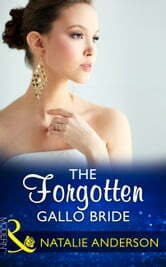 She believes their vows were swiftly annulled but, unbeknownst to Zara, a car crash wiped Tomas’s memory before he could release her from their agreement. Grateful to her rescuer, Zara agrees to be housekeeper at Tomas’s English mansion while he recovers. Prowling the corridors is the tortured shadow of a commanding man – who she’s shocked to discover is still her husband! Being in close proximity to Tomas again awakens a powerful longing between them. Will this intense hunger remind him of the ties that bind them?